If you don't know what a Z Palette is, I'll quickly fill you in. Basically its a case that holds all of your single eyeshadows. What you do is depot your shadows (take them out from their case) and then they will stick to the magnetic bottom of the Z Palette. Some eye shadows already are magnetic, and some are not. Those that are not will need magnets to stick. Simple enough! I didn't think I ever wanted or needed one of these. I like the idea of having all my shadows in one palette, but it seemed as if it would be too much work. This was until I decided to clean up some makeup (when I got that train case) and realized - WOW! I have way too many single shadows. Some of them I bought, a lot of them were from gift with purchases. 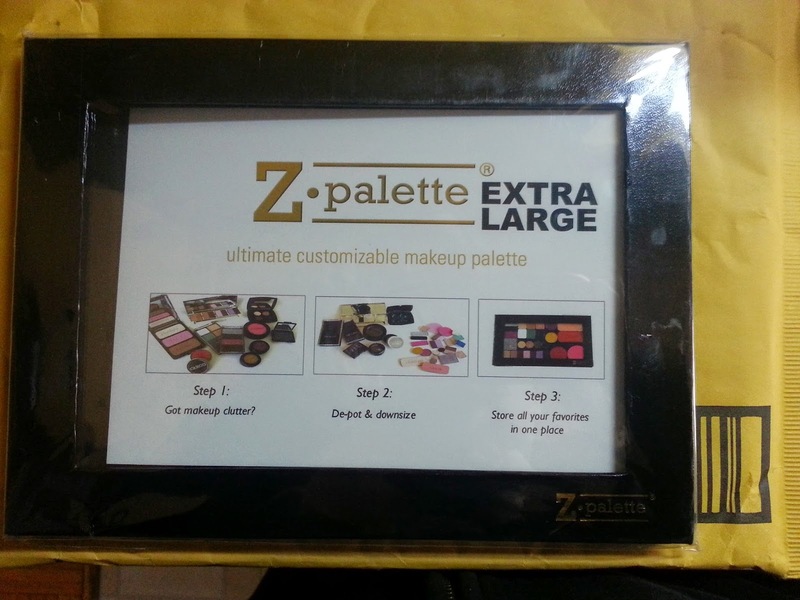 Anyway, I decided I needed a Z Palette. I ended up ordering it off of Amazon, and it was delivered today. It took less than 2 days to even get here. I was shocked! Well last night I was excited and depotted all of the shadows I wanted to keep. 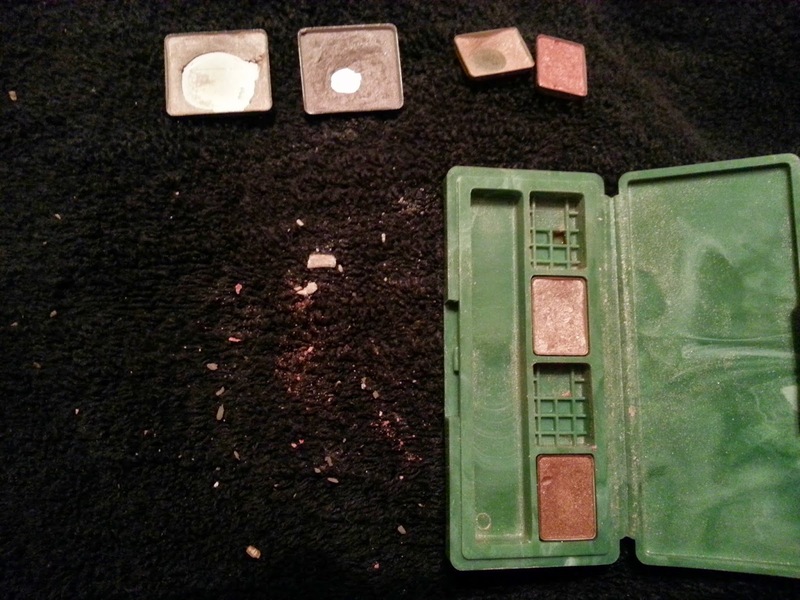 The two bigger square shadows are from maybelline, and the small 4 squares are from a Clinique gift with purchase. All of these were actually metallic on their own, and they came out really easily. I thought this was going to be a breeze. It was a little messy, but it wasn't too bad. They actually sell a special remover tool online. I've seen it on Amazon, and a ton of other sites that sell the palettes. I didn't want to buy the tool, I figured this metal dentistry thingy (I don't know the name...) would work well enough to fit through the sides of the shadows and pop them out. Which it did, but it slipped a few times and I ruined a few shadows (no big deal to me, because these weren't expensive shadows I was depotting) I also managed not to stab myself at all, so that's a plus. There are tons of youtube videos and articles online that you can find that help you to depot your shadows. Some say to use parchment paper and your hair straightener. Others use a candle. I didn't do any of that. I literally stuck the metal thing in the side, and popped those suckers out. Which also may be why I ruined some of them. I actually managed to fit all of my depotted shadows into the case. They sent about 20 magnetic stickers as well, so for those that weren't magnetic, are now. They send round ones and small rectangle ones. As you can see above, I did ruin some shadows, but like I said, they weren't expensive shadow - so to me, it's not a big deal. A lot of them were E.L.F, maybelline, and plenty that were gift with purchases. As you can see, a lot of them have hit pan. So, this gives me a reason to use them all, since they were all hidden away not being used. Also, there's a way to use alcohol to fix your broken shadow, but I didn't bother. 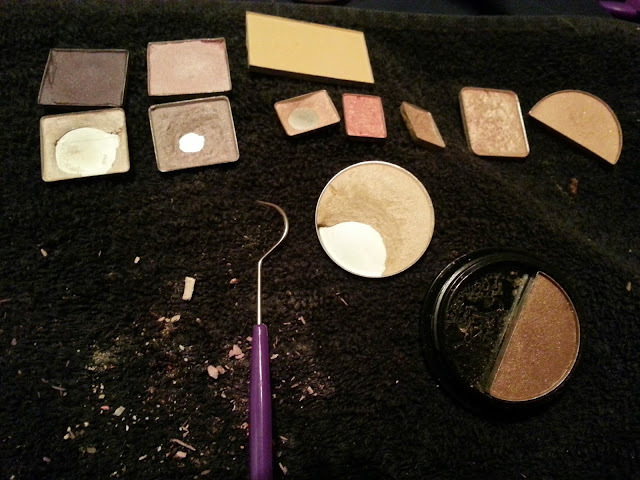 Have you depotted your eyeshadows?! Do you find it better now that they are all in one place? !